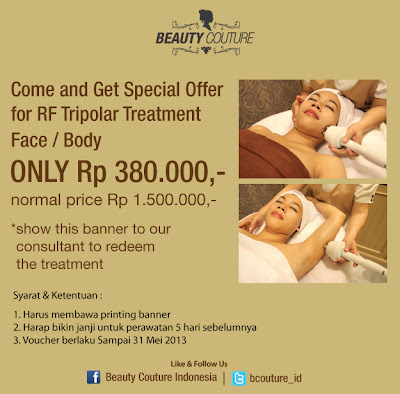 There will be 6 winners and the prizes are sponsored by Beauty Couture Indonesia !! 3 Winners will receive free Detox Skin Therapy, I have tried it before and it's so refreshing and my face is sooo clean! It releases toxin inside your face because of pollution and stress! And 3 other winners will receive free Spa manicure and Pedicure, my mom had this before, and her hands and feet smell so good because of the chocolate mask..
Beauty Couture is only located at Mal Taman Anggrek 2nd Floor so you've to come to the store by yourself to get the treatment..
You can share the tweet and facebook status everyday to earn more points! The 6 winners will be picked randomly, and the more you have points, the more you'll have chance to win the giveaway! It's not impossible to win detox skin therapy and spa manicure pedicure together though if you're lucky! You can tweet and share the status required to earn more points everyday! Anyway, if you're interested with the same treatment that I am doing right now to tighten my face and upper arm, you may have special promo by printing this picture and show it to the staff!! Ok done, now I'm praying to be the winner!